Hey everybody--I just realized how long it's been since I did an outfit post, and the stars just so happened to align to make this Sunday's snapshot an opportunity for one. 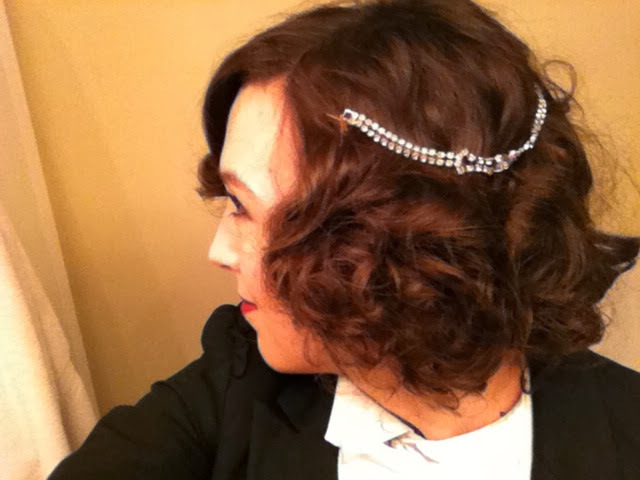 The outfit itself is a bit of a retread, so I'll just put up some, well, snapshots of it. 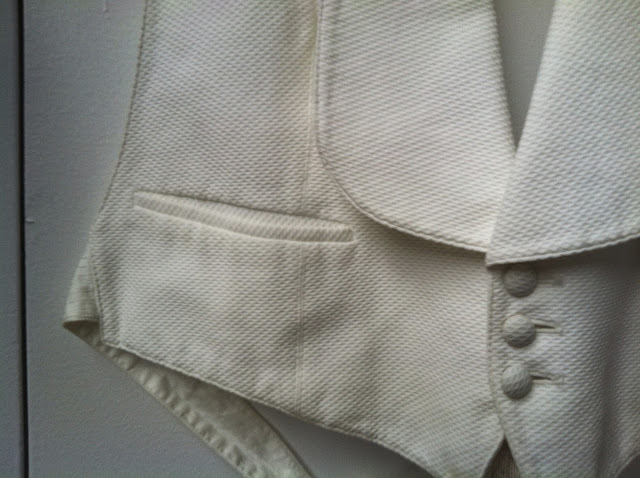 A few weeks ago, I saw this men's waistcoat at my hands-down favorite New York vintage store, The Family Jewels. I couldn't justify purchasing it at the time, as my budget's pretty tight, and I thought the price was a little too much. I did some investigating on Etsy and a few other sites and well, guys & gals, I learned a little something about market value. 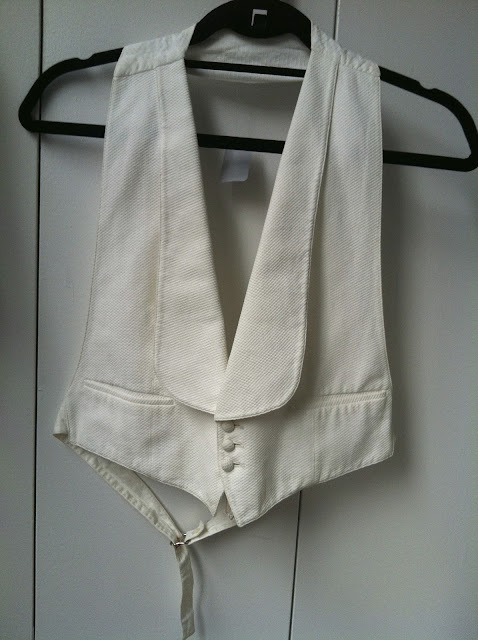 If you search for "men's white waistcoat" on Etsy, Ebay, or the like, you'll find very slim pickings. I found a few, mostly located abroad, all priced at almost the same as The Family Jewels priced it--with shipping added, exactly the same. One listing had it for significantly cheaper, but it was missing some parts, and looks like more of a grab bag of a few waistcoats, without exact photos of the one you'd be getting for your size. This is an excellent case study in why it's important to know the value of the vintage for which you're looking. I had no idea what a waistcoat was worth, or at the very least, what the market value--what people are willing to pay for it--was. (I differentiate slightly here, because there are a number of items out there with market values significantly higher than what they're worth to me. Bakelite, I'm talking about you.) Turns it, probably due to its rarity, the value for this type of menswear is more than I thought, so I had to shift my perspective. I only make a note of this because, with the price of vintage garments going up from their increasing rarity, it's something to consider when shopping--what's it worth, and what's it worth to you. I must have spent at least three weeks periodically checking, calling around to stores, etcetera, when I realized yeah, it's clearly worth it to me, so enough already, go back and get it--assuming it was still there. 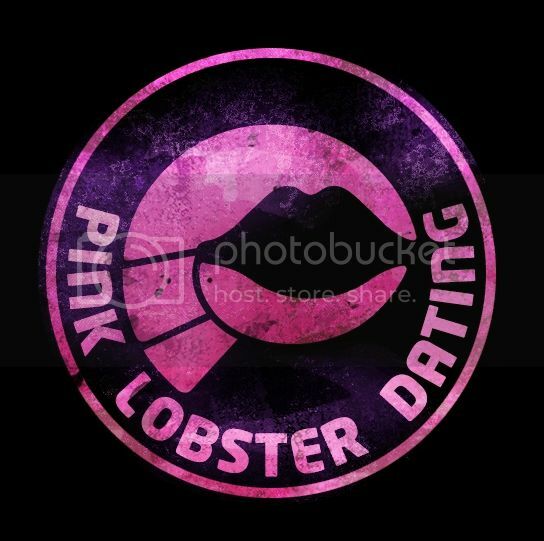 It turns out, I may have gotten there at the exact right moment, because when I arrived at the store, there was a small party of men shopping for a wedding, and they'd overtaken at least half of the waistcoats. I had a minor panic (always a sign I should have just bought it already) until I found it, snatched it, and brought it home. Obviously paying for it in between. As you can see, it's really high-quality, something I couldn't be certain enough about via online shopping. The store dates it somewhere from the 1930s-1940s, and the texture is really beautiful. 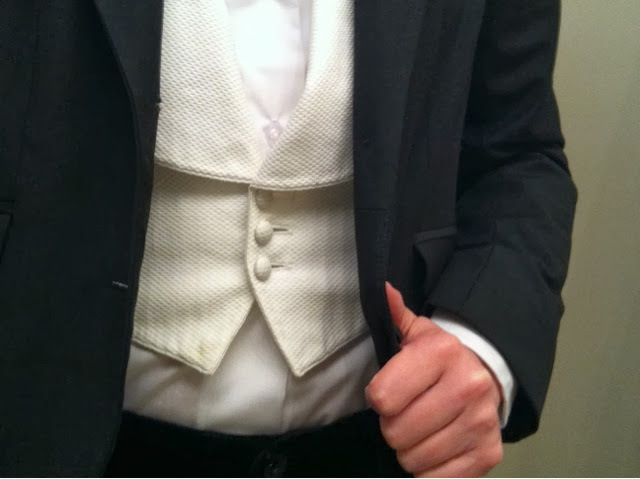 I wasn't sure that I loved the fact that it's not a full-backed waistcoat, but honestly, that's the most minor detail, given how beautiful the cut of the lapels is, the pockets, the covered buttons, everything. It just so happens, tonight I have a premiere to attend. I'd planned on wearing a beautiful dress my friend Erin had tailored for me, but I absolutely forgot, since I last saw it, that it's missing a belt, and that it has a stain at the hem, neither of which I've fixed since I bought it and handed it over to her. I actually feel pretty awful about not being able to wear it, since she sent it up specifically so it'd get to me in time, so I now owe her even bigger. 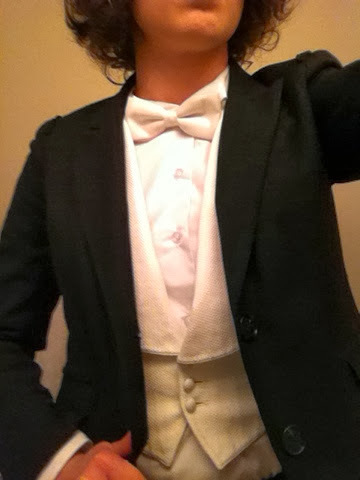 But, since I'm on to plan B, I thought I'd make the most of my new-to-me menswear acquisition. It's similar to my Marlene Dietrich outfit, and in fact, all I'm changing are the pants--exchanging the looser-fit, high-waist trousers for velvet cigarette pants. 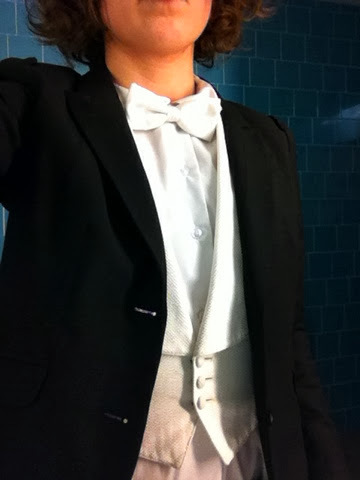 For a working event, I thought it'd be better to mix some modernity into the fit. 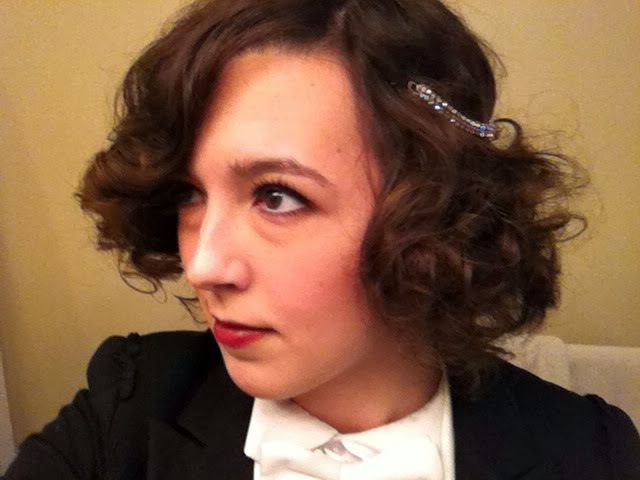 I also wanted to try something with my hair I'd been contemplating for a while now. I've said I'm not terribly interested in accessories, and that's very true for a tuxedo, where any additions would cheapen the look (I think). I do, however, have a soft spot for new uses. This bracelet came with a broken clasp, but since it's too lovely to sit on my dresser until I fix it, I thought--why not? Is there anything you've bought that ended up costing more than you'd thought? Or anything you saw, left, and rushed back to get in a please-please-still-be-there panic? I have done EXACTLY what you went through here - finding something, sighing about the price, doing digging and going back fretful it is gone. It's an experience I think all vintage lovers go through at some point! I'm glad you got your hands on this. It's a spectacular piece and I'm sure you'll get a lot of use out of it! Thank you!! You're right, it's the worst experience, but totally inevitable-- when I saw those groomsmen I was just about in a cold sweat. I'm excited to try it out with a skirt suit, too, particularly because I'm not super wild about the way it looks with modern, lower-waisted pants (as seen above). Fitted, high-waisted suit slacks-- just another thing to add to the ever-expanding wish list!